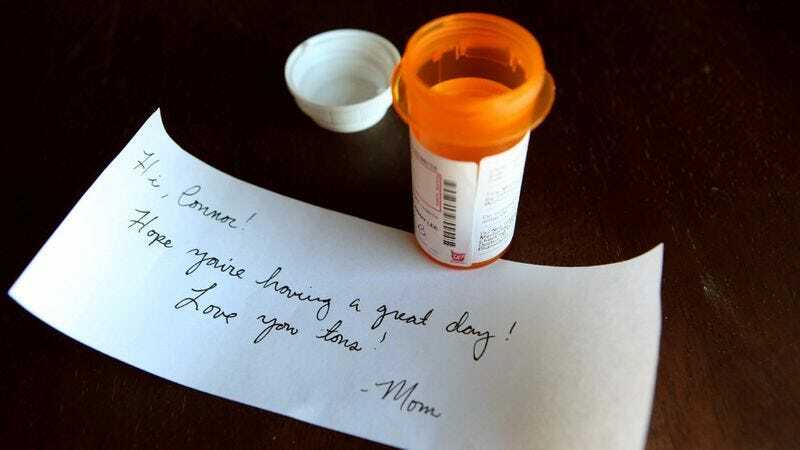 TACOMA, WA—In an effort to express her affection and brighten her son’s day, local mother Julia Parker, 43, reportedly tucked a loving, handwritten note into her 11-year-old son Connor Parker’s bottle of Concerta medication Monday morning. “Hi, Connor! Hope you’re having a great day!” read the cheerful note that was carefully placed into the sixth-grader’s container of prescription psychostimulants and was intended to be read between third and fourth period, when he regularly takes his 36mg dose. “Love you tons! Mom.” At press time, Connor had reportedly traded his prescription medicine for a friend’s Adderall.